creamy chunkiness and savoury flavour that egg salad needs to have. Perfect for smushing between the softest, whitest bread for that ultimate nostalgia factor. I’ve only been vegan for about 5 years, but I guess it’s been my whole world so publicly for a while now, so people forget that I used to eat animal products, quite fervently, before that. So many people struggle with certain things when going vegan: sometimes it’s butter, cheese, milk in tea, or eggs. I can’t say that the vegan cheese products out there completely fill the void that sits in my heart, but it does the trick. The last thing I struggled to give up when I went vegan was eggs. Not that eggs were my favourite food, but there was a nostalgia and simplicity to eggs that quite frankly, tofu scramble cannot completely replicate. That’s not to say that I’d go back on my commitment to this lifestyle and eat eggs again (clearly, since here I’m sharing a vegan egg salad recipe), but I will admit that I miss being able to roll out of bed and crack some eggs for a simple and easy breakfast that takes very little thought or premeditation. No longer would I frequent a late night diner for one of those all-day breakfast specials, nor would I find brunch with friends quite as easily. It’s unfortunate that animal products are so accessible and normal in our world, because there are so many memories that involve the simple egg. I used to take a lot of Greyhound trips from Ottawa to go home for the holidays or to visit a long distance high school sweetheart. The memories seem so fresh, yet when I think about it, it was really 10 years ago. I think memories from 10 years ago can be categorized as nostalgia, right? The bittersweet feeling of leaving all my friends in Ottawa for a couple weeks over Christmas break or leaving my family to be welcomed back into my dorm. It’s funny, looking back at how much you can grow in a decade. The problems that ate away at me and broke my heart 10 years ago; they seem like light scars, instead of the ugly, painful gashes they once were. That long stretch of trees on the highway as you got closer to Ottawa gave me a sense of tranquility and silence I so desperately needed as I sorted through all of my issues. I bring this up because much to my surprise, egg salad sandwiches don’t bring me back to my mom’s school lunches, but instead, they remind me of the plastic-wrapped, soft white triangles I used to buy on the one pit-stop between Toronto and Ottawa that the Greyhound would take. 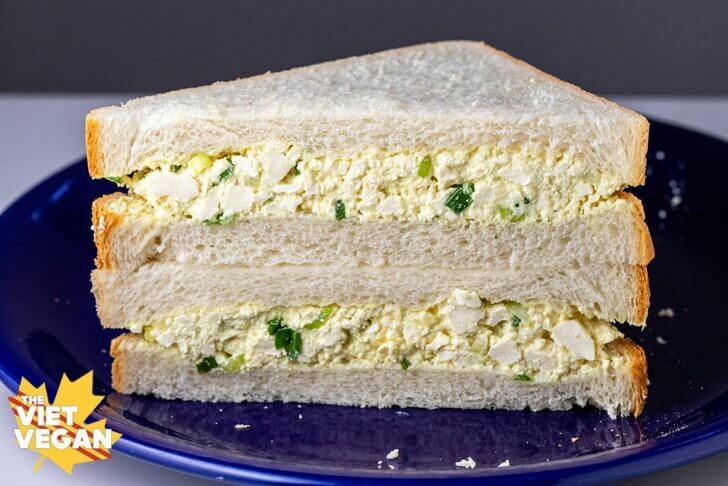 These egg salad sandwiches had been sitting in between those layers of bread for the day and were never so soft that they were soggy. Instead, they all but melded into the bread in the most perfect way. When I sank my teeth into them, it was the perfect amount of creamy egginess that all of my problems were forgotten, just for a few moments. I’d wash it down with a bottle of sweet, iced tea and settle back into my cramped seat, hoping I didn’t disgust my seat-mate with my stinky egg salad sandwich. Eddie has been trying to get me to veganize egg salad for him for a while, and I think I hesitated for a while because I knew I’d remember. So much has changed since then, and those scars have healed over. 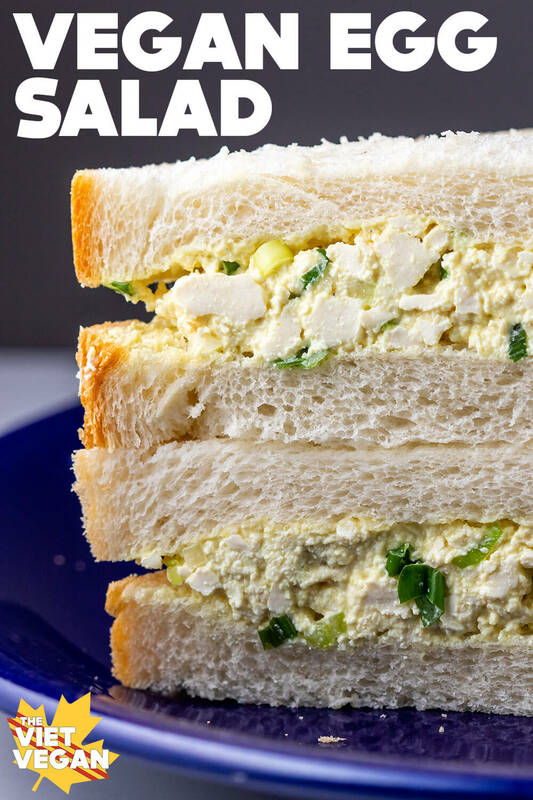 I finally perfected the vegan egg salad and when I smush it between two layers of ultra-soft white bread, I am brought back to watching trees glide by and biting down into creamy, eggy perfection. Some crunch from the onion and celery, eggy flavour from the black salt, and the secret ingredients: celery salt and pickle brine, to bring this comforting sandwich to veganized life. It seems silly, to be so nostalgic about a sandwich I bet so many kids got made fun of for eating, but here I am. In a mixing bowl, crumble the tofu until you have a scramble-like mixture. In a small bowl, combine vegan mayonnaise, mustard, dill pickle juice, black salt, ground turmeric, black pepper, and celery salt and mix until all ingredients are incorporated. Combine the mayo mixture with the crumbled tofu, diced celery and green onion. Stir to combine well. If you like it to have a little bit of a creamier texture, take about 1/2 cup of the mixture and blend with a hand blender or food processor. Stir that mixture back in. Put on your favourite, soft white bread for that simple sandwich if your childhood, or use some whole grain bread and add some extra veggies like sliced cucumber, green lettuce, or some sliced garden tomato for something a little more nutritious. Made this at 3am, super easy recipe to follow. Followed it exactly and it was great! Then your words echoed about Eddie not liking dill, so I added dill and also chopped pickles, still really great! 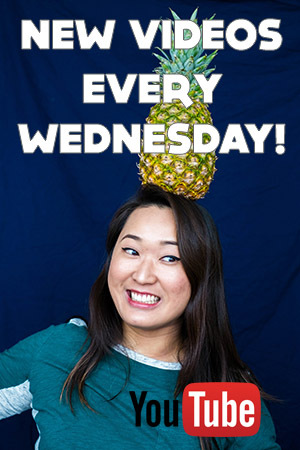 Thank you for your awesome recipes and humor! I was inspired to make this last night so I could have it for breakfast this morning. Absolutely delicious,I can't get over how much like egg salad this is. Thank you, genius recipe. this looks amazing! egg salad is one thing i dearly miss... tbh i miss all things egg...also lisa i would love for you to do some instant pot recipes! This was so super easy and absolutely delicious! Wow! This is good! Pretty authentic tasting. I might zhoosh it up a bit next time, but the texture is spot on (I used half firm tofu and half silken to really get the right mouthfeel). Thanks for the recipe and your great vid, too. And the suggestions to let it sit awhile was perfect. Ohmygawd I can't wait till tomorrow when I can eat another tofu-salad sandwich! No, I'm not having two tofu salad sandwiches for lunch—you are! *nom nom nom* You guys, make this the day BEFORE you want to eat it. It is good day one, but it's next level on day 2. Only problem for me is that it makes a crapload of filling. Wondering how long this keeps in the fridge? Thanks for a great, inexpensive, and easy-to-follow recipe. We generally have had it last about 5 days :) But we eat it up before then haha. Great flavor! I used medium firm tofu the second time and it had a good texture. 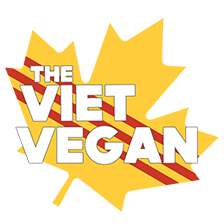 Sei semplicemente fantastica!Sono appena rientrata dal Vietnam , cercavo la versione vegetariana e glutine Free per le mie esigenze , lo trovata nel tuo sito.Grazie di esistere . This is the BEST egg salad evvvvaa. Thanks, Lisa. You seriously are amazing. The texture is so perfect; genius idea to use the hand blender. I make this regularly!